I’ve decided to include a weekly feature post simply titled “thoughts on home”. As you know I’m moving, in one month from today actually. Holy Shiz, that date has crept up on me. I’ll take any packing/moving advice you have, and thanks in advance for that…I am going to be staying somewhere temporarily while I search for a house. I have a couple of details to button up but I really hope to find a place this winter!! As a single mama, an unlimited budget is something I don’t have (and something I know most of my readers don’t have) I am keeping the faith that I’ll find a wonderful spot for my two kiddies and me! Onto the post…I’ve of course set up a Pinterest Board entitled “new home” that will include inspiration shots and deets on my thoughts. Feel free to follow along..
One of the first spaces I’ll need to set up is my home office. I eventually want to rent an office space in a quaint town but as long as my children are in childcare/preschool, that’s not happening!! 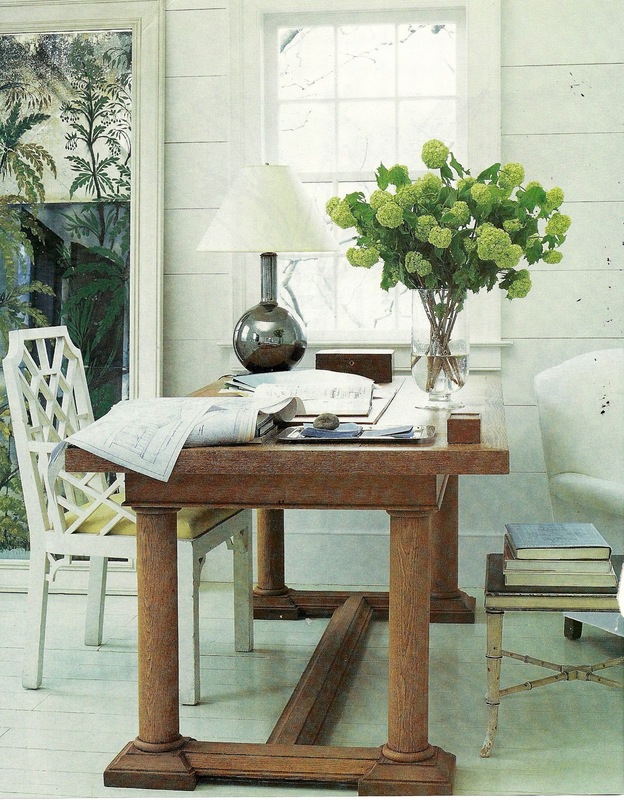 I currently love the idea of using a large over sized farm table as a desk. They’re ideal because they are often too narrow to dine on but are rustic enough to take a little abuse. Farm tables can often be found at Flea markets for a reasonable price. A large surface is key for a designer because we need a multifunctional work area to read plans, sketch and look at a slew of finish and fabric samples. I love the balance of sophisticated feminine details and simplicity in this shot. Restoration Hardware has the best selection of tables and this desk could work really well because it’s actually a desk, and includes storage. 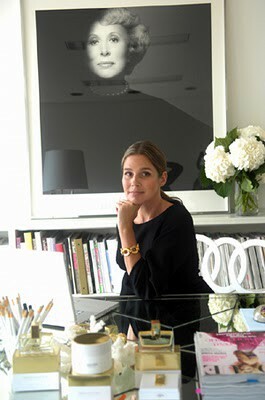 I will absolutely include pretty organization and gold and white accessories a la Aerin’s Lauder style. (obsessed) I love. love, love her entire office space!! A close second idea to the wood table would be a gold leaf X base desk, like the one below but for me right now the wooden desk is just more dare I say, practical. 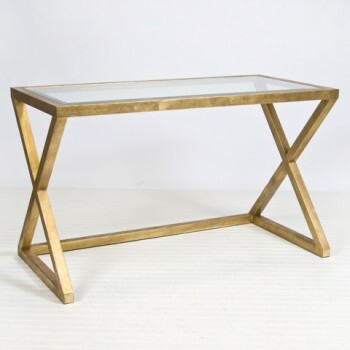 Thank you so much for the mention on Shop Ten 25's fabulous Gold Leafed Desk. We moved this past July. I had to set up my home office pronto as well. Moving with a 1-year-old, and a 2-3/4-year-old was a challenge, but it was good in so many ways. If I had to do it again, I'd say label, label, label those boxes! But, because you never know which end of the box you'll even be able to see in the pile, you might consider this Smart Move tape. I spied it at the Uhaul when we were DROPPING OFF the truck :(. It has room names printed right on the tape all the way down the roll. There is even one that says "Open First." Very useful. Also, I LOVE the desk images. I'm so on the same page when it comes to needing surface area. I also love working at more of a counter height and had found this table as inspiration. I don't work for U-Haul or the furniture store selling this table. Just some good finds! 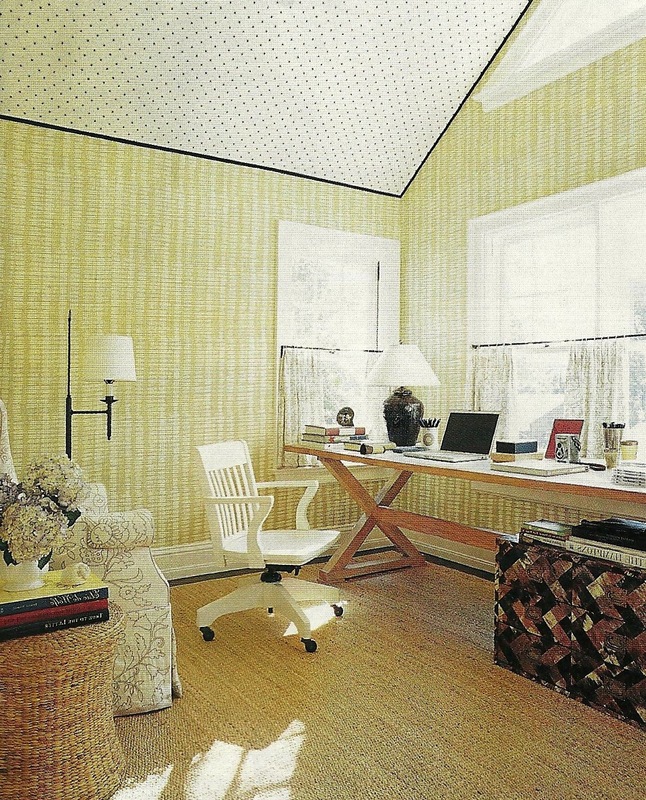 I love that first inspiration image with the chair, ottoman, desk, windows — perfect for working from home! Thanks Jen!! I think you're still on the s.s.
Hey, the South Shore? I am a little sleep deprived and it took me all day to figure that out! (and I hope I did…). No, we are more on the south coast / base of the cape now in a great town, Marion. I miss the old stomping grounds, but we have gone back up from time to time. I might end up going up to Rockland to The Rug Merchant this coming week. They are great if you are looking for a rug and carpet vendor once you move. Good luck! !